This is where you’ll spend an entire evening and all your money. 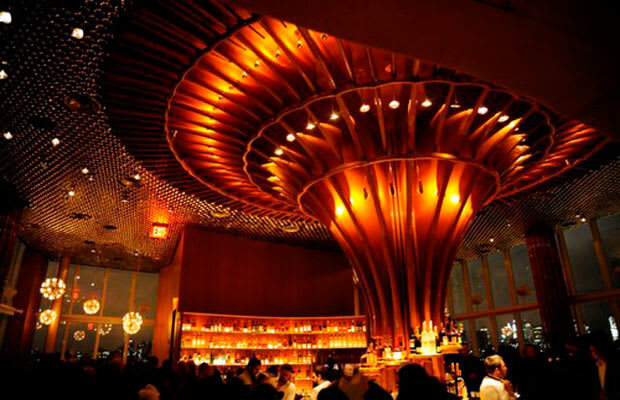 With truly unmatched, twinkling views of New York City, the Top of the Standard, formerly known as the Boom Boom Room, might be the most perfectly designed sky high bar in NYC, or otherwise. Floor-to-ceiling windows will have you feeling like you’re peering at the centerfold of the city—even the blacked out bathrooms are finished with windowed walls. The crowd is full of big spenders and model types, all making ridiculous New York chit-chat while lounging on retro cream couches and chairs, most of which are reserved for the evening. Drink prices correlate with the bar’s location: 18th floor venue, $18+ cocktails, but the unobstructed view is completely worth it. You’ll never want to leave.